Adventurer archetype Carl Akeley (1864-1926) was an exceedingly productive taxidermist, sculptor, explorer and inventor. His interest in ornithology begat a need to preserve specimens, so young Akeley read up on the subject and taught himself the basics of taxidermy. He subsequently landed a job with science education supplier Ward’s Natural Science Establishment, then further refined his craft in jobs with a series of increasingly prominent museums. Hearing of his achievements the British Museum in London offered him a position, but on his way, he stopped in Chicago where he was enticed to join their Field Museum of Natural History instead. Winning Carl over by the promise of African travel, he led two major expeditions while in their employment, the first in 1896 and later in 1905. — “Carl Akeley.” Wild Film History. Web. 17 February 2010. Chicago’s Field Museum has posted 136 of Akeley’s hand-coloured slides and black-and-white photographs to Flickr, a selection of which I have excerpted below. See their Africa Expeditions set for more. View of trees, hills, grass. 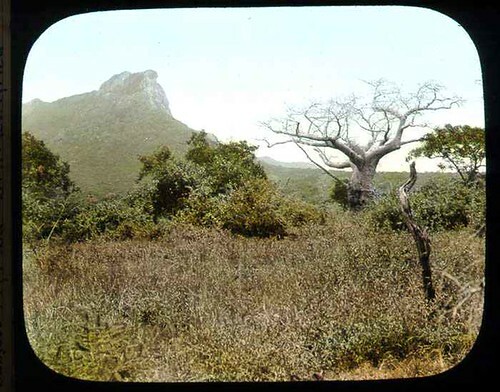 Lake Elementeita, Mau Escarpment, British East Africa, c1906. Flickr: originally uploaded by The Field Museum Library. Trees and scenes, mountain in background. Diorama accessory study. 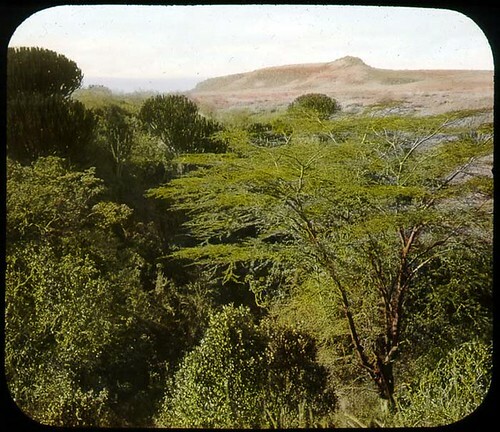 Voi, British East Africa, c1906. Flickr: originally uploaded by The Field Museum Library. View on river shore with large canoe or boat, abandoned. 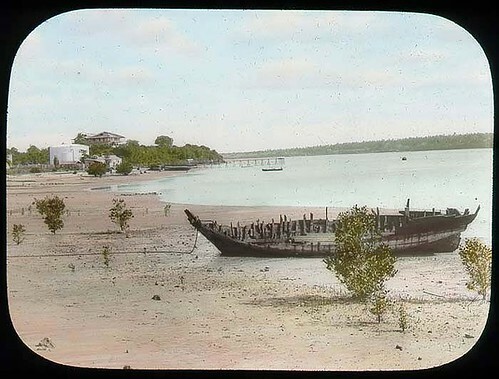 Mombassa, British East Africa, c1906. Flickr: originally uploaded by The Field Museum Library. 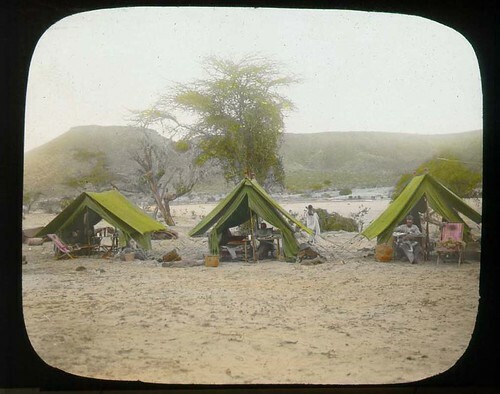 Expedition camp, three tents with members inside. British East Africa, c1896. Flickr: originally uploaded by The Field Museum Library. 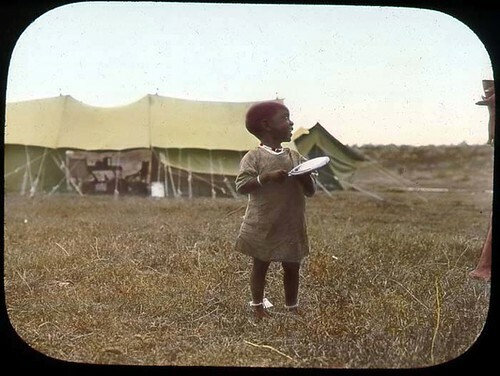 Small child in front of tents, holding an unidentified object. British East Africa, c1906. Flickr: originally uploaded by The Field Museum Library. Young cheetah growling at camera, teeth bared. British Somaliland, c1896. Flickr: originally uploaded by The Field Museum Library. 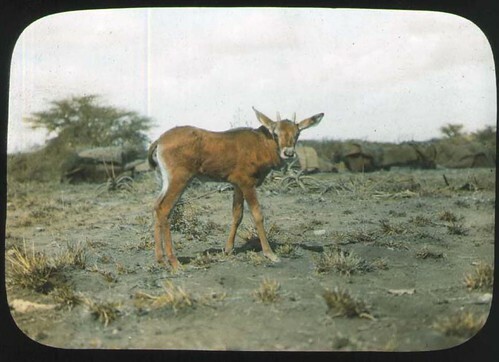 Young mammal, possibly Bovidae Oryx. British Somaliland, c1896. Flickr: originally uploaded by The Field Museum Library. 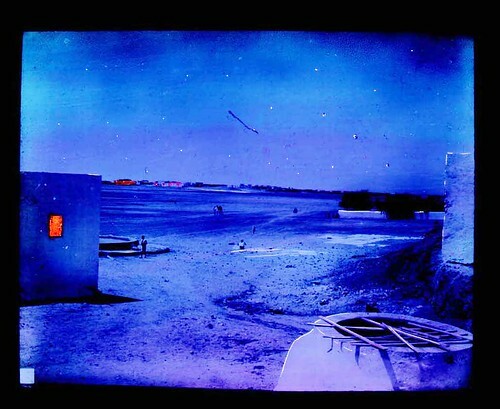 Berbera at night. Berbera, Woqooyi Galbeed, British Somaliland, c1896. Flickr: originally uploaded by The Field Museum Library. Akeley died during his fifth and final African expedition, and is buried in Albert (now Virunga) National Park. He left behind an enormous and meticulously catalogued collection of specimens—his crowning achievement. Today, three-quarters of a century after it was first opened to the public, that collection of 28 stunning dioramas continues to amaze visitors to the American Museum of Natural History. In total, Carl launched five collecting trips to the African subcontinent, joining Theodore Roosevelt on his 1909 expedition while he was working for the American Museum of Natural History in New York. 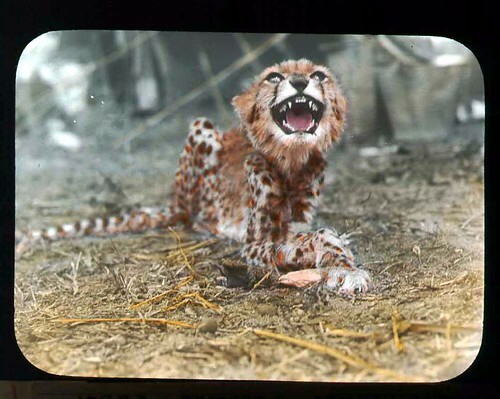 Filmed by Cherry Kearton for the feature, With Roosevelt in Africa (1910) it also provided many specimens still on display in the museum in a wing named in Carl’s honour – the Akeley Hall of African Mammals. Freed from an icy grave after almost a century, parts of the first aircraft taken to Antarctica—also the very first aircraft produced by Britain’s Vickers factory—have been located in Cape Denison, Commonwealth Bay. Australian geologist Sir Douglas Mawson had planned to conduct an aerial survey as part of his 1911-1914 Australasian Antarctic Expedition, but the plan was scuttled when the aircraft’s wings were damaged in an October 1911 demonstration flight. Mawson had no time to repair the aircraft prior to departure, so he ordered his electrical engineer/motor expert, Francis H. Bickerton, to remove the wings and convert it into an “air-tractor”—essentially a propeller-powered sled—to haul supplies. After hauling gear across a plateau for sixteen kilometres, the engine could not cope with the extreme cold and quit. The aircraft was eventually hauled back to the encampment and abandoned. When Mawson returned to Australia, the engine was returned to Vickers in the UK to help pay down debts; the rest of the fuselage frame was left behind at Cape Denison, and was visible up to the mid-1970s when it was presumed to have been swallowed by the ice. The aircraft was found on New Year’s Day by a team of Australians dedicated to preserving the site of Mawson’s first Antarctic encampment. AN HISTORIC monoplane – a relic of Sir Douglas Mawson’s 1911-14 expedition – has been found in Antarctica thanks to freakish luck after a three-year search. An Australian heritage carpenter stumbled on the remains of the craft – the first Vickers aircraft ever made – on New Year’s Day at Cape Denison. The cast iron framework of the plane was revealed by an unusually low tide and reduced ice cover. “It’s a remarkable find in remarkable circumstances,” chairman of the Mawson’s Huts Foundation David Jensen said. Nearly a century after it was abandoned by Mawson, the old Vickers was spotted sitting among rocks in a few centimetres of water during one of the lowest tides recorded at Commonwealth Bay. “They would not have been found had the tide not been so low and the ice cover at Cape Denison at its lowest for several years – it was a fluke find,” Mr Jensen said in a statement. Mawson's Vickers REP monoplane No. 1, before the accident that ended her flying career. The Vickers REP monoplane was designed in France by Robert Esnault-Pelterie (hence REP), but built by Vickers in Britain. There is also a slight Canadian connection, since the Oxford-born engineer Bickerton made his home in Newfoundland during the Roating Twenties. He is reported to have travelled between that colony and Britain quite frequently, easily shifting gears between the lifestyles of a New World outdoorsman and a fashionable London partygoer and man-about-town. For more information on the finding of the aircraft—and the current state of the Mawson huts in general—the Expedition Blog of the Mawson’s Hut Foundation is probably the best source (especially these posts; 1, 2). The State Library of New South Wales has posted a collection of images taken by photographer Frank Hurley during Australia’s first tentative explorations of the planet’s ice-bound southern continent. Students of polar history will know that Mr. Hurley and several other AAE members would go on to greater fame for their perseverance in Sir Ernest Shackleton’s ill-fated Imperial Trans-Antarctic Expedition (1914-1916); not to mention service in the Great War. Wreck of the ‘Gratitude’, Macquarie Island, 1911, originally uploaded by State Library of New South Wales collection. Mushroom ice formation, 1912 / Frank Hurley, originally uploaded by State Library of New South Wales collection. F. Bickerton looking out over seas near Commonwealth Bay, originally uploaded by State Library of New South Wales collection. Huskies pulling sledge, originally uploaded by State Library of New South Wales collection. Aurora traversing loose pack ice entering the Durville Sea, Dec. 1913, originally uploaded by State Library of New South Wales collection. Australian Antarctic Expedition members in the kitchen, 1911-1914, originally uploaded by State Library of New South Wales collection. Ice mask, C.T. Madigan, between 1911-1914 / photograph by Frank Hurley, originally uploaded by State Library of New South Wales collection. Mertz leaving the hut by the trapdoor on the verandah roof, originally uploaded by State Library of New South Wales collection. Bage in the entrance to the Astronomic Observatory, Antarctica, 1911-1914 / Frank Hurley, originally uploaded by State Library of New South Wales collection. See the entire Flickr set for more. A fascinating summary of the original expedition, and the modern effort to conserve its still-extant facilities. The story of Ardi takes us back 4.4 million years to a corner of northeast Ethiopia that today is a desert where erosion constantly exposes fossils from the dawn of humankind. In all, scientists have discovered fossilized bones and teeth in the area representing three dozen individual Ardipithecus specimens, including much of Ardi’s skull, pelvis, lower arms and feet. Until now, Haile-Selassie says, much of what we knew about our ancient past derived from comparisons with the other apes, and especially chimps, and from Ardi’s younger ‘sister’ — Lucy, the 3.2-million-year-old specimen of another hominid species, Australopithecus afarensis, discovered in 1974, also in Ethiopia. Lucy’s discovery showed that human forebears walked upright that long ago. But Ardi, Haile-Selassie says, shows our first erect steps took place more than a million years earlier and that is much closer to the last common ancestor (or LCA) that the human line shares with the ape line after the two split some six million years ago. Until now, it has been assumed chimps and gorillas have retained many of the supposed traits of that last common ancestor, among them knuckle-walking and climbing ability. Now, Haile-Selassie says, we know that isn’t true. Ardi shows that unlike modern apes, which are knuckle-walkers, her species — and by extension all the ancestors of all apes and humans — descended from a common ancestor that in turn was not a knuckle-walker, he says. …The researchers say the surprising findings mean chimps and gorillas have specialized greatly since then and are poor models for a common ancestor and for understanding human abilities such as walking. This further underlines the somewhat little-understood distinction that humanity is not descended from “monkeys”, but that apes and humans shared a common ancestor. It’s a big difference, and it’s important to remember that a lot of the ape traits that we see today actually evolved long after our developmental paths began to diverge. So while we can learn something from our modern simian relatives, they offer limited utility in understanding how we developed the unique capabilities that make us Homo sapiens. For that we have to go to the fossil record and continue to mine our own history. Our planet’s most southerly continent is notionally one of those awe-inspiring places I would like to visit. At least for a couple of hours. Ideally it would be as one of those C17 aircrews that flies in a load of gear and people, then jets right back out an hour later. Of course there is the incredible visual poetry of the place, which is no doubt part of the enchantment that drove such as Amundsen, Scott and Shackleton to hazard their lives in exploration of it. But it’s not all sweetness and light. The weather has rough days. And so does the sea, too. Canadian scientists who sequenced Canadian and Mexican samples of the swine flu virus say it is the same strain, even though the virus seems to cause more severe symptoms in Mexico. Scientists at Health Canada’s National Microbiology Laboratory in Winnipeg genetically sequenced and compared samples of the H1N1 flu virus from Nova Scotia, Ontario and Mexico. It’s the first time the sequence has been completed on samples from Mexico and Canada, said officials during a news conference in Ottawa Wednesday. The results have ruled out a mutation to explain why the Mexican cases have been much more severe than elsewhere, said Dr. Frank Plummer, the chief science adviser of the national lab. “Essentially, what it appears to suggest, is that there is nothing at the genetic level that differentiates this virus that we got from Mexico and those from Nova Scotia and Ontario, that explains apparent differences in disease severity between Mexico and Canada and the United States,” said Plummer. — CBC News, “Swine flu is same strain in Canada and Mexico“, May 6th, 2009. So what makes it so deadly in Mexico? Pre-existing medical conditions? Environmental stimulus? Genetic predisposition? Quality of care?